In addition to the various menus accessible from the menu, MAXQDA can be controlled using the toolbars and context menus in their respective windows. The functions that relate to the handling of documents are available in the “Document System” window. 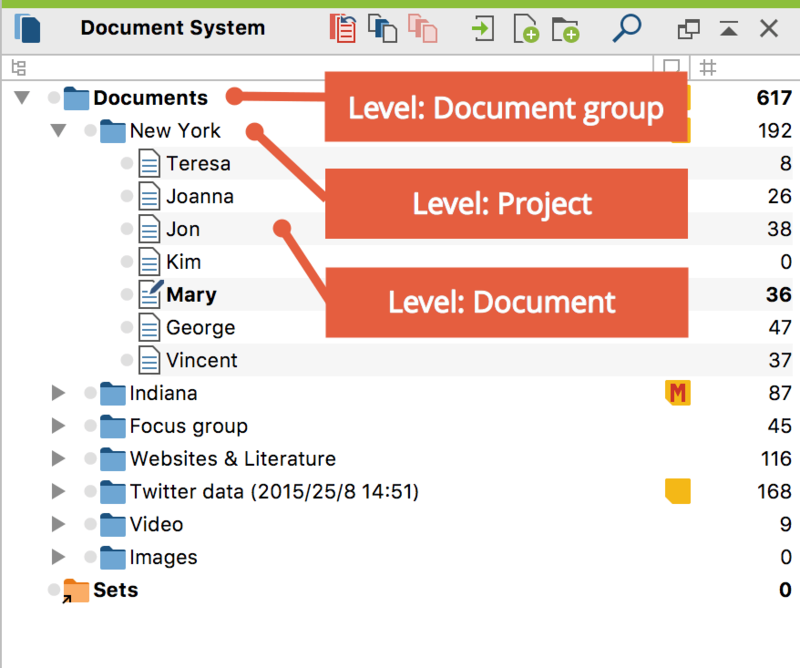 In order to better organize your documents, it is possible to create document groups. In MAXQDA, it is, however, not absolutely necessary that each document is put in a document group. Documents can simply be left in the root folder of the “Document System” window. Activate All Documents – activates all documents in the entire project. Deactivate All Documents – deactivates all documents in the entire project. Activate by Document Variables – allows you to create logical conditions based on the existing document variable values for selecting and activating documents. Activate by Color – this function enables you to activate documents by their assigned color. Invert Activation – activates all documents that are not currently activated and deactivates all those documents that are currently activated. This is especially helpful when doing logical activations; you can then very quickly compile segments from documents with contrasting document variables. Memo – creates a memo that can hold information about the entire project. New Document Group – creates a new document group. Collapse All – collapses all document groups for a better overview. Thus, the individual documents of the document groups will not be visible. Sort in Ascending Order – sorts all document groups in ascending alphabetical order. Sort in Descending Order – sorts all document groups in descending alphabetical order. Import Documents – you can import one or more files. These are assigned to the top level ( the “root” folder). Click on this function to open the usual dialog window. Select the document in the list and click open. The documents to be read can be formatted in the text formats TXT, RTF, DOC/X, PDF or in the image formats JPG, GIF, TIF and PNG. Media files can also be selected here, though they are not imported into the project file because of their size and are stored externally and assigned to a text document. New Text Document – inserts a new text document at the top of your “Document System” and opens it directly for editing. Move Activated Documents Here – moves all activated documents to the top level of the “Document System” window. This function is only visible if at least one document is actually activated. Overview of Coded Segments – lists all coded segments in the entire project in table form. Overview of Variables – shows the data editor of the document variables for all documents in the project. Overview of Codes – lists all codes in the entire project in table form. Overview of Memos – lists all memos in the entire project in table form. Overview of Summaries – lists all summaries in the entire project in table form. Overview of Links – lists all links in the entire project in table form. Teamwork > Export – exports the coded segments, memos, summaries and variables of your project. Teamwork > Import – imports the coded segments, memos, summaries and variables of an external project. Word Cloud – creates a word cloud with the most frequent words that appear in the documents within your project. Code Cloud – creates a code cloud with the most frequent codes that appear in the documents within your project. A project can contain as many different document groups as you wish to create. A context menu is also available at the document group(s) level, which offers functions that only affect that specific chosen document group. Activate All Documents – activates all documents in the document group. Deactivate All Documents – deactivates all documents in the document group. Memo – creates a memo that can hold information about the document group. Delete – deletes the document group, including all documents, coded segments, memos, summaries and variables that are associated with it. MAXQDA only completes the deletion after confirming that you do indeed wish to carry out the action. Rename – lets you give a new name to the document group. Import Document(s) – one or more new documents can be imported. These are assigned to the selected document group. Click on this function to open the usual dialog window for opening files. Select the document(s) in the list and click Open. Formats that can be read include TXT-, RTF-, DOC / X-, PDF-format or in the image formats JPG, GIF, TIF and PNG. Media files can also be selected here, but they are not imported into the project file because of their size. Instead they are stored externally and assigned to a text document. Sort in Ascending Order – sorts all documents in the respective document group in ascending alphabetical order. Sort in Descending Order – sorts all documents in the respective document group in descending alphabetical order. Move Activated Documents Here – moves all activated documents to this document group, thus resorting the “Document System” accordingly. This function is only displayed if at least one document is actually activated. Overview of Coded Segments – list all coded segments from the document group in table form. Overview of Variables – shows the data editor of the document variables for all documents in the document group. Overview of Codes – lists all codes used in one of the documents of the document group in table form. Overview of Memos – lists all memos in the document group in table form. Overview of Links – lists all links in the document group in table form. Overview of Summaries – lists all summaries in the document group in table form. Teamwork > Export – exports the coded segments, memos, summaries and variables of this document group. Teamwork > Import – imports the coded segments, memos, summaries for this document group. Word Cloud – creates a word cloud with the most frequent words that appear in the documents within this document group. Code Cloud – creates a code cloud with the most frequent codes that appear in the documents within this document group. Note: Document sets are handled similarly to document groups. They are a temporary grouping of documents, but only contain links to the documents instead of the documents themselves. The context menu that appears when you right-click on a document set is similar to the document group context menu, but it does not contain the options to import documents. A context menu is also available at the individual document level and contains a variety of functions connected to the chosen document. Activate/Deactivate – activates the document; if the document is already activated, the option will be to deactivate it. Open Document – opens the document in the “Document Browser”. The document which is currently opened in the “Document Browser” is indicated in the “Document System” with a special symbol (document with a pen). Open Document in a New Tab – opens the document in a new tab in the “Document Browser”. The document which is currently displayed is indicated in the “Document System” with a special symbol (document with a pen). Delete Document – The document and all its associated data (memos, codings, variable values) are deleted. MAXQDA only completes this process when you confirm the action. Rename Document – The name of the document can be edited. Export Document – The selected document is exported and saved to a location of your choice. Memo – creates a memo for the document. Overview of Coded Segments – lists all coded segments from the document in table form. Overview of Variables – shows the data editor of the document variables for the selected document. Overview of Codes – lists all codes applied in the selected document. Overview of Links – lists all links in the document in table form. Overview of Memos – lists all memos in the document and the document memo in table form. Overview of summaries – lists all summaries of the document in table form. Document Portrait – opens a visualization of the document that uses the code colors of the coded segments in the document to create a picture of the document. The size of the coded segment acts as the weighting factor, meaning that the longer the coded segment, the more space that color takes up in the visualization. Codeline – opens a visualization of the coded segments of the document. A matrix is created with the codes on the y-axis and the paragraph numbers on the x-axis. It is then possible to see which codes were used in each paragraph of the document. Word Cloud – creates a visualization of the most frequently-used words in the document (only for text, pdf and table documents). Code Cloud – creates a code cloud with the most frequent codes that appear in the document. Color Selection – Allows to assign a color to the document. Teamwork > Export Teamwork – allows for the export of all coded segments, memos, summaries, and variables for the document. The exported file can be imported in a project on a different computer. This function enables you to work in a team and divide the work on a single document among team members. Teamwork > Import Teamwork – allows for the import of coded segments, memos, summaries, and variables for the document of an earlier exported file. Properties – opens a window with all the properties of the document, which can then be edited (e.g. whether or not the document should be opened in read-only mode). You can also link a media file to the corresponding document (e.g. an audio file with the corresponding transcribed interview) to either code the transcript or the media file itself.